This photo was taken very close to Taharaa Mountain Lodge in Estes Park with the Twin Sisters Peak in the background. Even though there are quite a few homes in the area I was able to minimize them by getting down low, which brought the foreground rocks more into focus and made the couple pop from the green trees behind them. This wedding photo was taken just before the sun set behind the mountains, which made for dramatic lighting on the couple and the rocks. I'm not afraid of using direct sunlight for portraits as this allows the true Colorado colors come to life. I'll always remember the pure joy the bride and groom share for life. The bride had successfully fought off cancer, and had HOPE tatooed on her back as a constant reminder to stay positive. It reminds me as well how important documenting such an important day is, as you never know what lies ahead. I love shooting weddings at Taharaa Mountain Lodge. 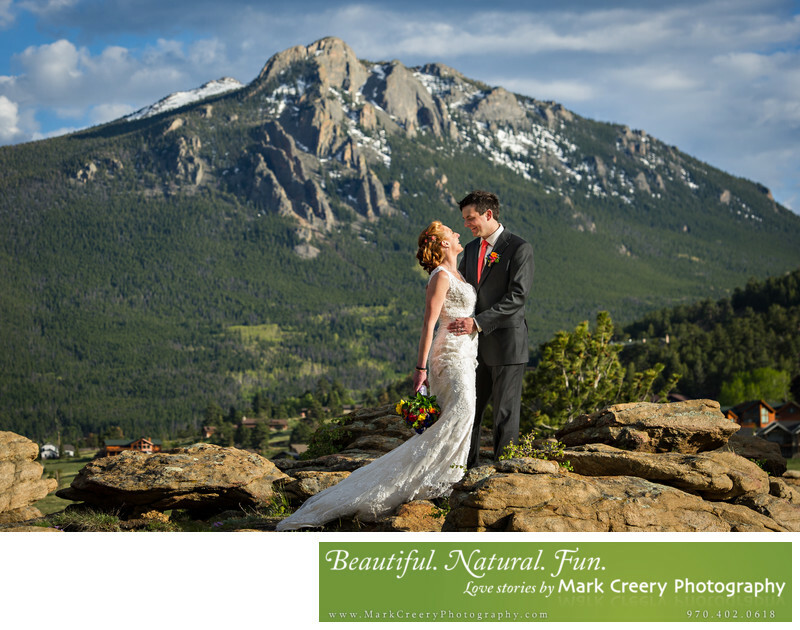 It's a perfect mountain venue, with sweeping views of the Rocky Mountains and Estes Valley right from their reception and deck. They have a beautiful pergola ceremony site as well as a covered deck in case of rain. Taharaa Mountain Lodge is located in Estes Park, Colorado. Contact: (970) 577-0098. Location: 3110 S St Vrain Ave, Estes Park, CO 80517.